Please select an option Hadlock Hannah & christian Kelly's kitchen Please select a Design. 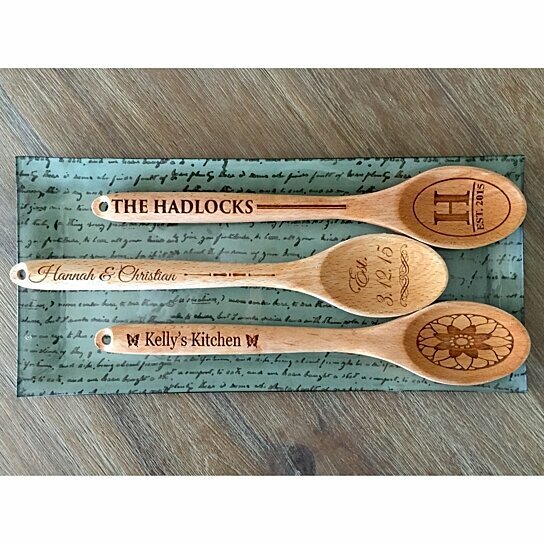 You will love our brand new 12 1/4 inch-long Personalized Decorative Wooden Spoons, especially at such an incredible price! Choose between three beautiful designs "Hadlock", "Hannah & Christian", and "Kelly's Kitchen"(Kelly's Kitchen design includes butterfly and flower) . The spoons have a convenient hole at the tip, perfect for hanging in any location you wish to add a touch of personalization and class. Order yours today! The Spoons are 12 1/4 inches long at are approximately 2 1/2 inch wide on the bottom and 1 inch wide at the handle.